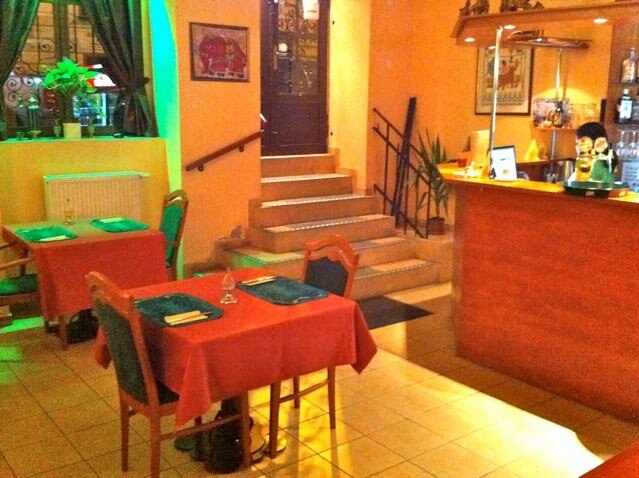 Yeah, Curry House has gotten good reviews by others and received a lot of positive comments on this website. But what I wanted to know was this: What would I think? 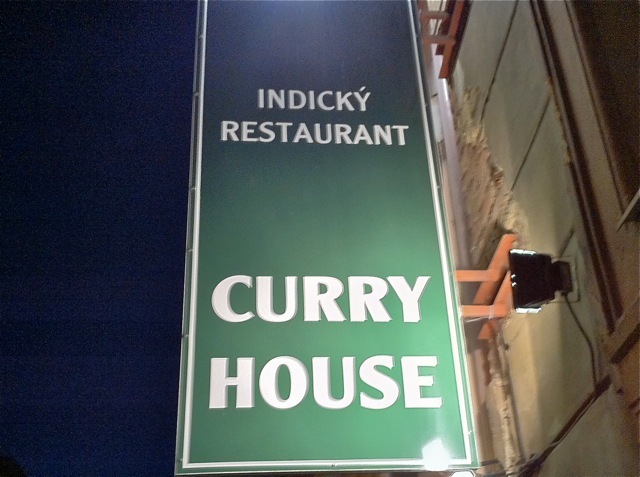 Is this Indian and Bangladeshi restaurant really, as one person said, up there with the best Britain has to offer? Is it "awesome?" Is it "excellent?" I had to find out. 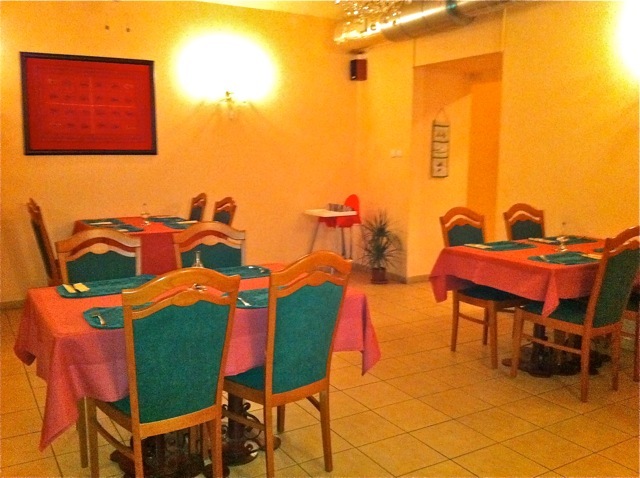 I got familiar with the area during my many visits to Palmovka to review ThaiOishi, which is right next door. I got even more familiar after I went three times to Curry House. As many have said before, the interior isn't much to look at. There's a small front room for smokers, and a slightly larger room in back for nonsmokers. Paint is peeling off the walls in some places. On two visits, it wasn't completely full, but I was wise to book ahead, because on the third visit, I would have been shut out. I met with V for a talk on my first visit. I wanted to try a bunch of starters, so we ordered the vegetarian thali (165 CZK). Recommended for two, this platter includes three small onion bhajees, two vegetable samosas, and vegetable pakora. In the middle was raita, seasoned yogurt sauce. 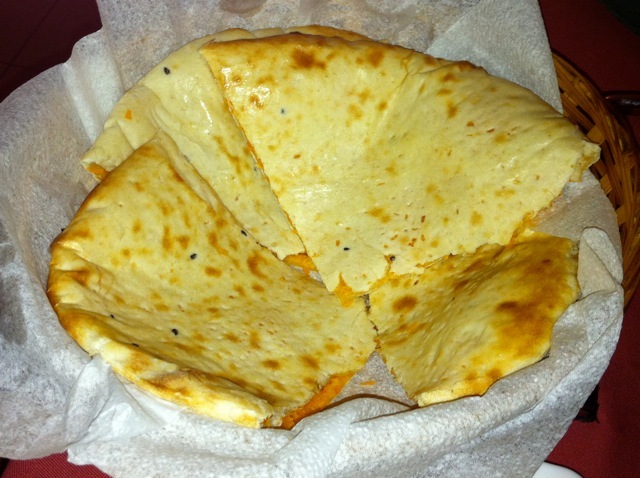 I loved the small, crispy, slightly greasy bhajees. The onions fried with lentil and chickpea flour were bursting with flavor. 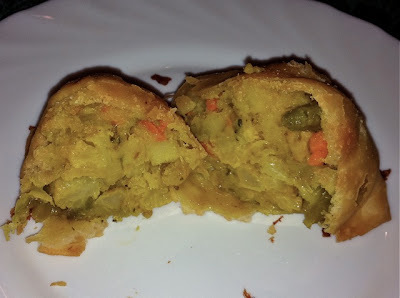 However, the samosas were mostly potato and mostly bland. 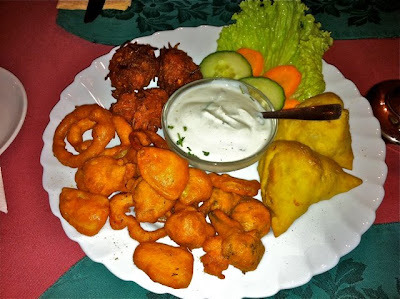 The pakora, a wide variety of batter-fried vegetables, were limp and boring and needed generous spoonfuls of the raita. For a main course. V got the lamb tikka masala (235 CZK), which was our favorite at the now defunct Taj Mahal ten years ago when its prices were still reasonable. She also got an order of pulao rice (50 CZK). 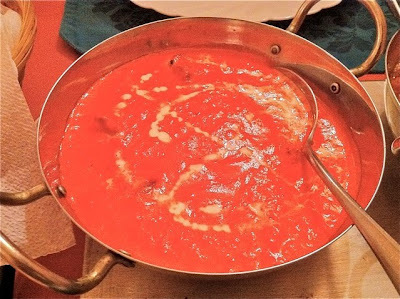 The sauce was of the creamy coconut style rather than the tomato-based variety found at Masala. The waiter asked if V wanted the sauce sweet or savory, since many customers prefer it salty. She chose sweet, like Taj Mahal used to do. The thick sauce was nice, but V said it had more flavor on a previous visit. I remarked that the tandoor-cooked lamb tasted very good and was relatively tender. V said that the lamb was actually better on this visit than her last. So consistency is an issue. 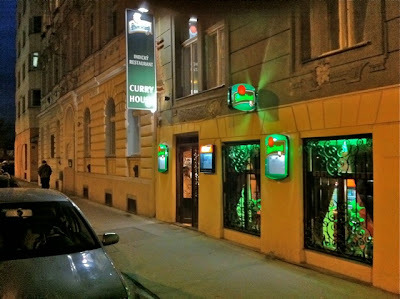 I had the rogan josh (225 CZK). The long-cooked lamb was fork tender. 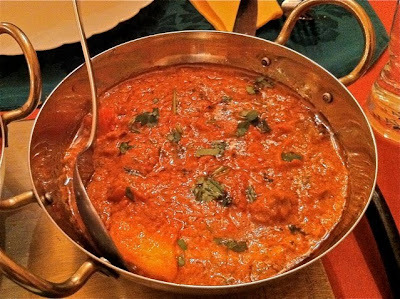 The gravy, which can include cardamom, cinnamon, clove, ginger, cumin, and red chillies, among many other spices, was delicious. 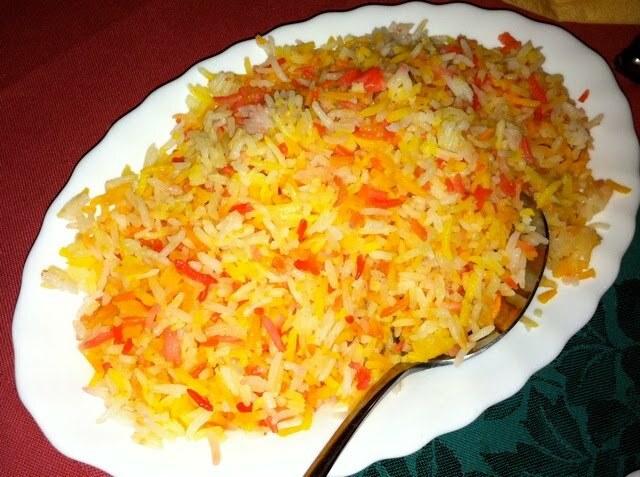 It was sprinkled with cilantro leaves, which added to the pleasure. 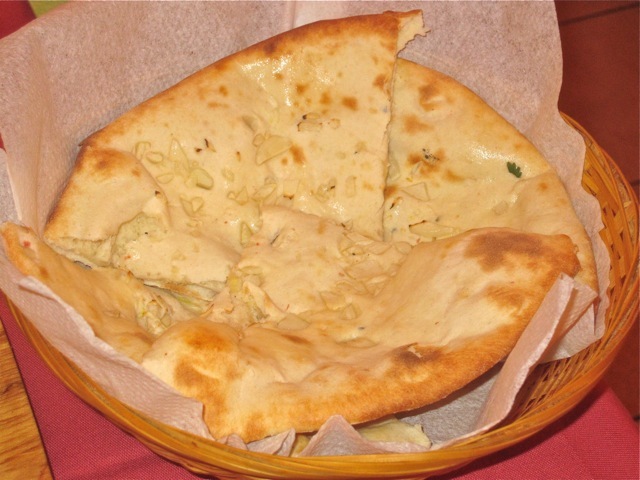 On the side, and also as a sort of dessert, we had Peshwari nan (60 CZK). The round bread was fluffy and hot, filled with coconut and sugar. I really like sweet-salty combinations, and it contrasted well with the rogan josh. But V also liked dipping it into the quite similar sauce of the lamb tikka masala. I had a couple of half-liters of Gambrinus (32 CZK each). 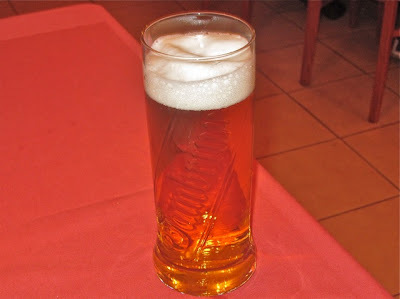 V had an Indian tea (35 CZK) and a bottle of Mattoni (25 CZK). The total bill was 859 CZK before tip. Not too bad. 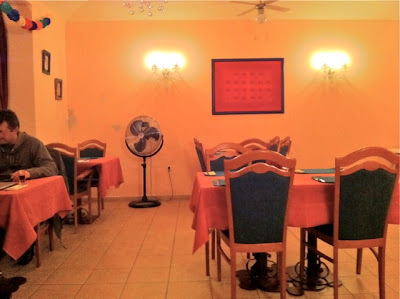 A few days later, I found myself with no dinner plan and ended up back at Curry House by myself. 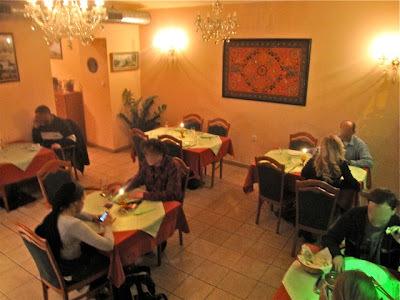 On this visit, I started off with the meat samosas (75 CZK). I thought it might need something to complement it. I ordered the "green chutney" to go with it, something I'd never tried before. 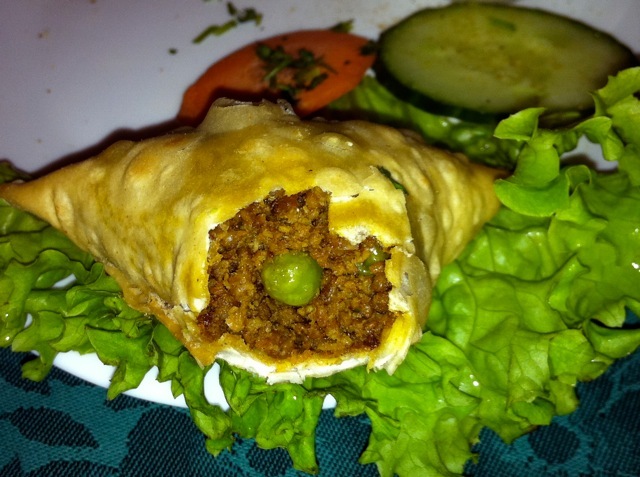 Inside the samosa, the spiced ground beef with a few peas was a little dry, but more tasty and interesting than the veggie version. However, the chutney was not a good match. 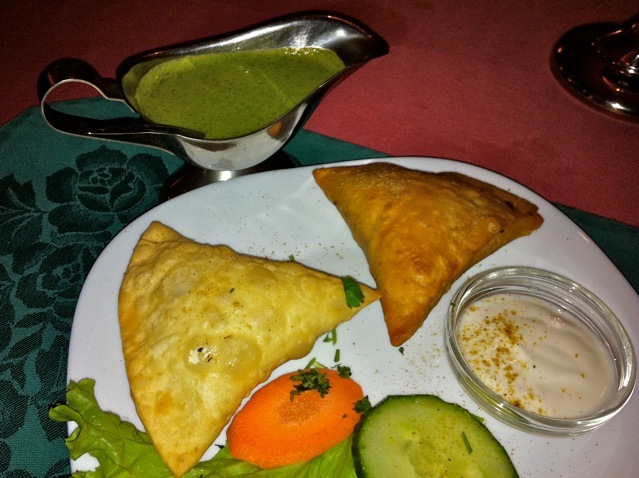 The intensely salty sauce did not go well with the salty samosa. The menu said it was fresh mint and coriander leaf with bangladeshi spices. I tasted the mint, but coriander element was missing. For a main course, I tried the butter chicken (185 CZK) with pulao rice (50 CZK). Some have complained of small portions, but I counted 15 chunks of chicken in the pan. That said, you do get far fewer pieces when you order a lamb dish. I really enjoyed it. The red gravy looked similar to the tikka masala sauce, but it was salty, buttery, and creamy. In a word, richer. Some oil did pool around the sides. There was a hint of cilantro and it brought a pleasant, slow-building burn. That's how I like it, but if you like it spicier, it shouldn't be a problem. 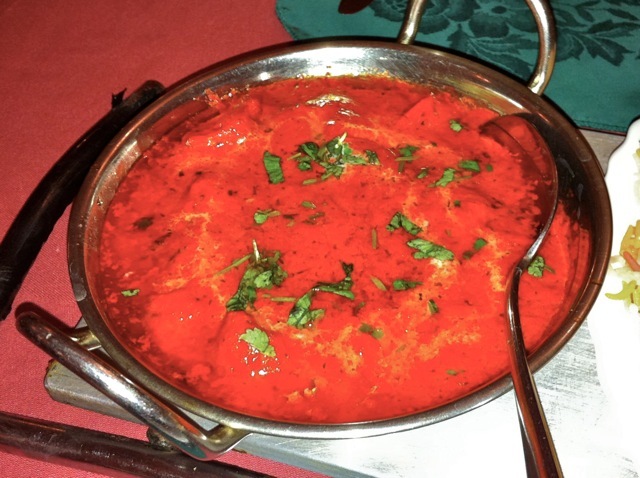 Many have complimented Curry House for making things seriously hot upon request. The bill for this solo trip was 382 CZK before tip. For my last visit, I took along a British friend, Misty Potts, who knows a little something about Indian food. Her parents were born in India. When I invited her, Misty told me that, in her opinion, Curry House has the best tandoori in the city. So we went straight to it and ordered the tandoori thali (330 CZK), a platter of various meats cooked in their tandoor. Later, the waiter walked in at a quick pace carrying a sizzling iron plate. 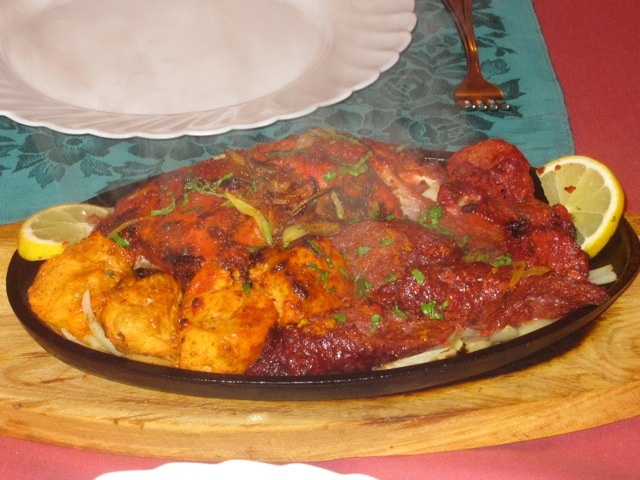 Cooking on top was murgh tikka -- chunks of chicken breast, murgh tandoori -- a chicken leg with attached thigh, lamb tikka -- chunks of tandoori lamb, and shish kebab -- ground meat mixed with herbs and spices. The murgh tandoori and the lamb tikka were my favorites. The chicken breast was OK, but less flavorful. The shish kebab was a little dried out and crumbly under its coating of tasty seasoning. On the side, we had an order of garlic nan (55 CZK). This was fresh and good, but be warned, it was well stocked with big slices of almost raw garlic. 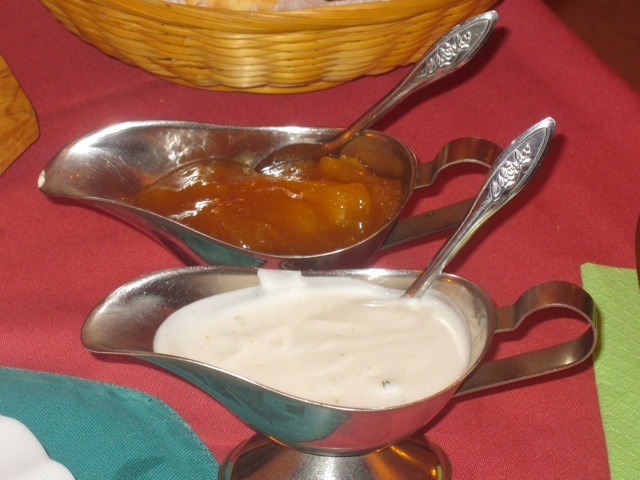 To add a sweet note to it all, I got mango chutney on the side (35 CZK). But we weren't quite done with the sweets. 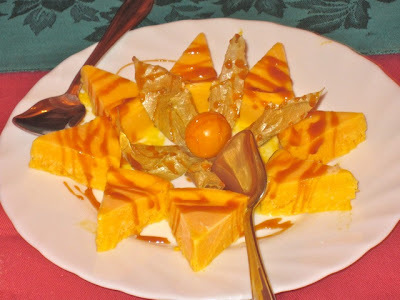 Misty was in the mood for some mango kulfi (65 CZK). I'd never had this frozen dessert before. She told me that she's had creamier versions. The texture of this one wasn't the best due to ice crystals. But once it melted in your mouth, it was creamy and pleasant. This final bill was 577 CZK. Served was almost always friendly and quick. So, what can I say after this meal? I wasn't stunned by Curry House, and I wouldn't call it great art, but I would say it's quite good. I've had better Indian meals outside this country, but it's up there with the best I've found here. The next time I want some Indian food, I'll consider Curry House for a repeat performance. We eat Curry House food on a weekly basis, so it is worth noting that they deliver(!) Pavel (the delivery man) is responsive, fast, friendly and speaks great English. We are in Prague 6, so the delivery charge is not cheap, but it's still cheaper than Taj Mahal delivered food prices and the same/sometimes better quality in our view. Thanks for the tips on some dishes that we'll have to try. I go to the Curry House for lunch once in a while and I am always happy with the meals and readiness. Yesterday we even called up ahead of time and they had the stuff ready for us when we got there. Talk about making a guy hungry on a Saturday morning, Brewsta. Haven't been to Curry House yet. Me and the wife I think are about the only people to rate the Pakistani place at the bottom of Seifertova. Ive heard other people say bad things about it, and it's often empty, but we love it. oh heck, is that how much things cost in CZ these days? ?